Joan Marcus A colorful Priscilla pulls into the Fox Theatre. Through February 10 at the Fox Theatre, 527 North Grand Boulevard. Tickets are $15 to $66. Call 314-534-1678 or visit www.fabulousfox.com. As you might expect, a musical about two drag queens and a transsexual journeying into Australia's Outback by bus is rife with spectacle. The costumes (by Tim Chappel and Lizzy Gardiner) are sublime confections of color and imagination, the wigs are monuments to fantasy, and even the bus (Priscilla) wears a digital skin that allows it to flicker with flames or change color in an eye blink. All of this is matched by a club-songs greatest hits that includes Madonna, Donna Summer, Cyndi Lauper and "MacArthur Park." There's just not much substance behind the dazzling façade. Priscilla Queen of the Desert is the story of Tick (Wade McCollum), a Sydney-based drag queen who has a wife (Christy Faber) and young son (Shane Davis) in far-off Alice Springs. With his drag career on the skids, Tick accepts his wife's offer of a brief residency performing at her casino, despite his fear of meeting his son for the first time. Yes, that's substantive. How does a gay man explain his decision to leave his family for show biz to a young boy? Will his son accept him for who he is? Unfortunately, Stephan Elliott and Allan Scott give short shrift to this subject; the question is raised in McCollum's performance of "I Say a Little Prayer" in the first act, and one that's summarily answered in a father-son duet of "Always on My Mind" in Act Two. In between is a two-hour span of hits, costume changes and catty jokes, with little time given to Tick's family matters. That's not to say there isn't a lot to enjoy in those two hours, particularly if you're a fan of the music (or jaw-dropping costuming). McCollum is a rubbery, loose-limbed dancer, a quality that's exploited to good effect on the aforementioned "MacArthur Park." His traveling companions are Bernadette (Scott Willis) and Adam/Felicia (Bryan West). Willis brings a graceful, Veronica Lake-iciness to Bernadette, the older transsexual who is mostly retired from performing and is now looking for true love, while Adam/Felicia is the blazing yang to Bernadette's cool yin. From his first appearance with a sizzling, bang-on performance of "Material Girl," West is the sort of drag queen you can't ignore. But even with his statuesque physique and blistering voice, he's only the second-brightest scene-stealer in Priscilla. Top honors go to Chelsea Zeno for her portrayal of Cynthia, a frustrated performer in a flyspeck town who brings down the house with her unconventional rendition of M's "Pop Muzik." 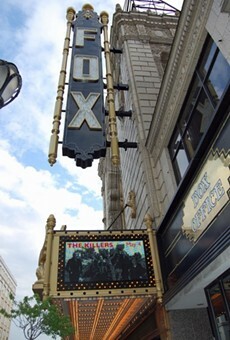 One occasionally hears stories of the Tijuana ping-pong-ball trick, but I never expected to see it performed at the Fox. So there are surprises, and laughs, and moments where you can't quite believe what you're seeing in this Simon Philips-directed Priscilla. But they soon pass, and you wonder where the time went.